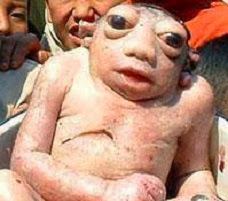 The neck-less baby with its head almost totally sunk into the upper part of the body and with extraordinarily large eyeballs literally popping out of the eye-sockets, was born to Nir Bahadur Karki and Suntali Karki at the Gaurishnkar Hospital in Charikot. Experts looking into this case concluded that the mother came into contact with spérms of a frog while bathing in a river. And coincidentally that was the exact time she was ovuláting. "We wouldn't have been able to save it, even if it had been brought here alive," said a nurse attending to the mother at the hospital, "This is an extremely abnormal case." The "baby" weighed 2kg at birth and was born after the normal nine-month gestation period. Suntali, already a mother of two normal daughters, was not suffering from any illness during the pregnancy. Nir Bahadur, the father, says he does not feel any remorse for the newly-born baby's death. "I am happy that nothing happened to my wife," he said.